Info "Move the knife to cut the steak. Mmm. Meat is good." What's Your Beef? is a microgame in the Reality folder in WarioWare, Inc.: Mega Microgame$!. The word "beef" is another term for something someone has against someone else. In the middle of the screen, there is a steak with a knife next to it. 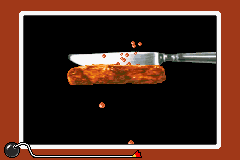 The player must use the to move the knife back and forth and cut the steak in half. The farther the knife slides, the deeper the cut is, but it does not necessarily have to go to the end of the steak on each stroke for the player to win. 1st level difficulty: The steak is thin. It requires around three big strokes to cut. 2nd level difficulty: The steak is thicker. It requires around four big strokes to cut. 3rd level difficulty: The steak is extremely thick. It requires around five big strokes cut. This page was last edited on September 27, 2018, at 13:36.